Every time I go to an Italian restaurant or even just a cafe that has risotto, I just have to order it. My first taste experience was at Sofia’s Restaurant in Ferntree Gully, and well I found it to be delicious. I don’t think Sofia’s is an example of true authentic Italian food but it tastes quite good and I can’t argue with that. So I’ve wanted to cook risotto for some time too, just something that seemed fun to do since we hardly go to Italian restaurants so it was just another way to eat it. 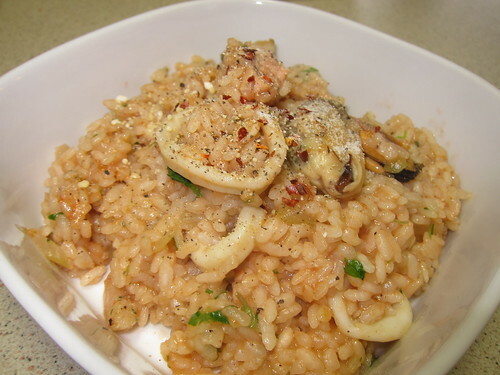 I found a couple of recipes on the internet but I needed one that had a seafood mix (Scallops, prawns, mussells, fish, squid rings) since we bought the frozen type at the supermarket and some of the risotto recipes get you to buy different types of seafood for the stock so it wasn’t any use to me. I finally decided on the Taste.com.au’s recipe, and just bought some fresh mussels to use for the stock as the mussels in the mix were already opened. I made a couple of tweaks to the recipe though. At first I couldn’t find Fish stock, so I bought some Ikan Bilis stock cubes from my Asian Grocer, and then I found a small carton of Fish stock at my local supermarket so I mixed them both to make my fish stock. 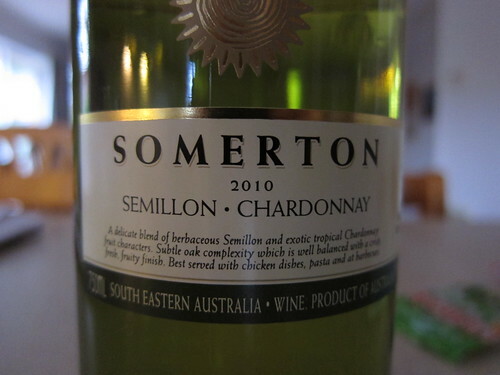 For my dry white wine, I used Somerton 2010 Semillon – Chardonnay, one of the cheapest dry white wines I could find at Dan Murphy’s actually. I didn’t have enough prawns in my mix, and forgot to buy extra prawns but it didn’t impact upon taste really. It’s just a matter of what seafood you prefer. I really like the recipe but one thing I forgot to do was to add more passata into it after I added another half cup of arborio rice so it was a bit drier then I would like but the taste and flavours were all still there. With my fresh parsley straight from my herb garden, chilli flakes and a sprinkle of parmesan cheese, my Seafood Risotto came out pretty well I thought. I also pretty much used all the stock available because I added more rice, so it wasn’t as wet as what you might get in a restaurant but still moist enough. If I made this again, I would probably use less mussels and more prawns, just because of preference and there were probably too many mussels in there and slightly overwhelmed everything else. Other than that, I really enjoyed making it and the end result was great too. 1. Place wine in a wide pan over medium-high heat. Bring to a simmer, then add mussels and cover. Cook, shaking the pan occasionally, for 3 minutes until almost all shells have opened (discard any mussels that remain unopen after this time). 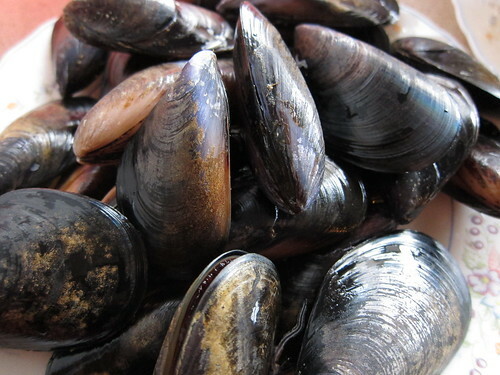 Strain, reserving liquid, then remove mussels from shells and set aside. Place reserved liquid, fish stock and saffron in a pan and keep at a simmer over low heat. 2. Melt 30g butter with 1 tbs oil in a large, heavy-based frypan over medium heat. Add prawns and cook for 2-3 minutes, turning, until cooked through. Remove to a bowl and set aside. Increase heat to high. Add squid and scallops. Cook, turning, for 1-2 minutes until just opaque and almost cooked through. Set aside with prawns. 3. Reduce heat to medium and melt remaining 10g butter with remaining 1 tbs oil. Cook the onion, stirring, for 2-3 minutes until softened. Add garlic and rice and stir for 1-2 minutes to coat the grains. Add a ladleful of hot stock and stir until absorbed. Continue adding stock, 1 ladleful at a time, stirring and making sure each is absorbed before adding the next, until rice is al dente. This will take about 20 minutes. (You may not need all the stock.) Stir in the seafood, passata or sugo and parsley. Season and cook for 1 minute until heated through. Serve garnished with parsley, chilli flakes and parmesan. This will be my first of many restaurant, fooderies etc that I’ll be sharing my dining experiences with. Was invited for a surprise 21st birthday celebration at Medici, and serves Italian food (One of my favourite cuisines). The venue was quite nice, it had a relaxed, casual vibe to it and can cater up to 300 people so it was quite large and open. The waiters/waitresses were friendly and efficient. I ordered the Vegetable Risotto (My vegetarian phase) and the group of us shared a few large pizzas as well. I recall it had diced carrots, small broccoli and diced tomatoes in a napoli sauce, it looked decent. My experiences with risotto lie solely with Sofia’s Restaurants, so I’m no expert but my taste buds know good food! Taste wise, it was average, the napoli sauce had no flavour to it, it was very generic Italian that even a can or jar supermarket sauce could beat. Basically, it was nothing special. The actual risotta was cooked just as I wanted it, not overly soft that it resembled a porridge but texture wise it was up there with my only other risotto experience. My friend ordered the Risotto Pollo and visually looked great, mine just didn’t look as appealing at all and the taste met that. Would I go back? Possibly, to try the pastas or the other risotto but I wouldn’t be rushing there any time soon.